Building a network involves taking chances and seeing the opportunities that you may have at any given moment. 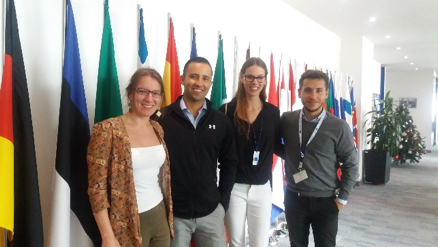 During the Winter break, we traveled to Colombia, Rafael’s home country, and we received the opportunity to visit the EU Delegation in Colombia. After looking at their website, we contacted Albert Lladó, an intern from Spain who was working with the Delegation at the Press, Policy and Information Section. We introduced ourselves as a German student and Colombia student with the MAEUS program at the University of Illinois in Urbana-Champaign. Mr. Lladó kindly replied to our email, letting us know the available time for our visit. On January 5th, after a strict security protocol to access the building, we met for one hour with Mr. Lladó and Victoria Csonka, the Junior Professional in Delegation Press, Policy and Information. Once we were invited to the meeting, we then presented Mrs. Csonka with the questions we prepared which mostly revolved around the relations between the EU and Colombia and the presence of the EU in Latin America. We began asking about the way the EU is represented in Colombia, and how the Colombian people can recognize the EU, and also how they perceive it. It was very interesting to hear the many ways in which the EU is showing its presence in Colombia. Members from the EU Delegation, for example, travel to universities to reach out to students through guest speakers and the promotion of volunteering opportunities and internships with the EU Delegation. It was also very interesting to hear that Colombians generally perceive the EU as something positive, mainly due to all the references of the media in Colombia about all the aid provided by the Union to the country. Being curious about job opportunities after our studies, we also asked Mrs. Csonka and Mr. Lladó about their personal backgrounds and the way that led them towards working in the EU Delegation to Colombia. Mrs. Csonka was part of the Junior Professional in Delegation Programme established by the European External Action Service and the European Commission, which gives qualified junior professionals from the member states the opportunity to be appointed to one of the EU Delegations abroad, and work there for two periods of 9 months or 1.5 years in total. Mr. Lladó was an intern from Spain, and on the day of our meeting, he had his last day of work. After our conversation, Mrs. Csonka gave us a tour of the office, and also introduced us to more members of the EU Delegation to Colombia including Ms. Rachel Brazier, the Head of the Political, Press and Information Section of the Delegation. We felt very welcome, and everyone was very enthusiastic about our visit, and our interest in the European Union. Our visit to the EU Delegation was a success in many ways. We got interesting insights into the EU’s work in Colombia and became aware of the impact it has in the Latin American country. This is especially important now, when Colombia is finding itself at a significant moment of the country’s history and development due to the recent peace agreement signed between the Government and the guerrillas group FARC. Having studied the EU mostly in theory during our studies, it was very refreshing for us to see the practical side. However, the most valuable detail for us was the positive feedback we received from the members of the Delegation during our visit. This visit was a first step into building our network, and making use of the opportunities that one can find. Rafael Rodriguez is a first year MAEUS student from Colombia with a Bachelor’s Degree in Education of Foreign Language Teaching. Learn more about the EUC's MAEUS program, the home of the only Master of Arts in European Union Studies in the Western Hemisphere.